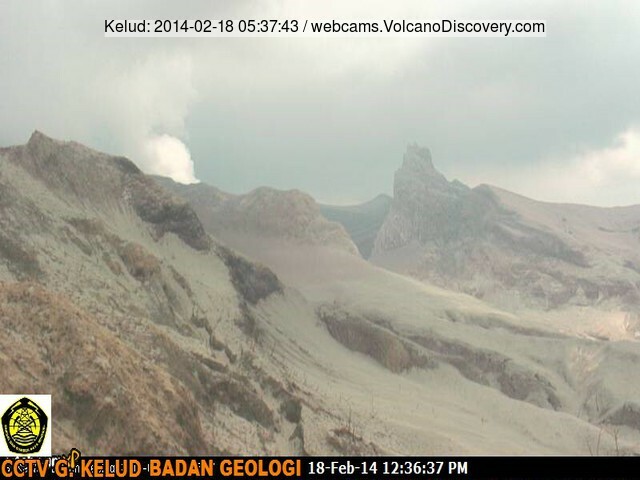 Kelud (East Java): Activity has calmed down at the volcano. The new VSI webcam shows the outer crater area covered with heavy ash deposits and only a small steam plume from the crater. Fuego (Guatemala): Activity has been elevated yesterday, with more frequent moderate and strong explosions accompanied by rumbling degassing sounds and shock waves that could be noticed in up to 20-25 km distance. Ash plumes rose to 500-700 m. The observatory warns that another stronger eruptive phase could occur in the next days or weeks. The current seismic signal suggests, however, that the activity has been decreasing again. Tungurahua (Ecuador): After the major eruptions on 1 Feb, the volcano continued to produce frequent (comparably) smaller explosions of strombolian to vulcanian type, sometime causing small pyroclastic flows. Ash falls have been mainly affecting areas in Penipe, south of the volcano. During the past days, activity has been decreasing overall. IGP reports an earthquake swarm on 10 Feb, when a series of volcanic-tectonic quakes occurred under the northwestern flank of the volcano between Pondoa and Juive Grande. The earthquakes were at depths between 10 and 11 km below the crater and measured up to magnitude of 3.0 on the Richter scale. The largest were widely felt in villages around the volcano. These seismic events could represent an increase in pressure in the volcano caused by a new batch of magma in its conduit, or, alternatively, it could suggest a relaxation process.